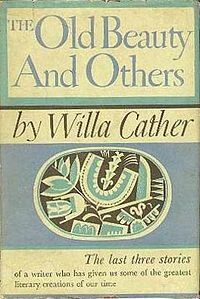 I found out only after Googling this volume after I finished reading it that it contains what may be the last stories Willa Cather ever wrote. At least it was billed that way, and it was published a year after her death in 1947. The one that stays with me is “The Best Years,” which strikes me almost like a first stab at My Antonia--where the symbol of goodness, family and love that Antonia represents is achingly filled by the character of Lesley Ferguesson, a young teacher, living away from her rural Nebraska family. Given the chance for a rare visit home by the itinerant superintendent of schools, Lesley takes the reader down a memory lane filled with nostalgia and homesickness. Here, the narrator describes the place where her brothers are her slept and dreamed as children. “Upstairs” was a story in itself, a secret romance. No caller or neighbor had ever been allowed to go up there. All the children loved it--it was their very own world where there were no older people poking about to spoil things. And it was unique--not at all like other people’s upstairs chambers. In her stuffy little bedroom out in the country Lesley had more than once cried for it. Lesley and the boys liked space, not tight cubbyholes. Their upstairs was a long attic which ran the whole length of the house, from the front door downstairs to the kitchen at the back. Its great charm was that it was unlined. No plaster, no beaver-board lining; just the roof shingles, supported by long, unplanned, splintery rafters that sloped from the sharp roof-peak down to the floor of the attic. Bracing these long roof rafters were cross rafters on which one could hang things--a little personal washing, a curtain for tableaux, a rope wing for Bryan. In this spacious, undivided loft were two brick chimneys, going up in neat little stair-steps from the plank floor to the shingle roof--and out of it to the stars! The chimneys were of red, unglazed brick, with lines of white mortar to hold them together. Last year, after Lesley first got her school, Mrs. Ferguesson exerted her authority and partitioned off a little room over the kitchen end of the “upstairs” for her daughter. Before that, all the children slept in this delightful attic The three older boys occupied two wide beds, their sister her little single bed. Bryan, subject to croup, still slumbered downstairs near his mother, but he looked forward to his ascension as to a state of pure beatitude. There was certainly room enough up there for widely scattered quarters, but the three beds stood in a row, as in a hospital ward. The children liked to be close enough together to share experiences. Experiences were many. Perhaps the most exciting was when the driving, sleety snowstorms came on winter nights. The roof shingles were old and had curled under hot summer suns. In a driving snowstorm the frozen flakes sifted in through all those little cracks, sprinkled the beds and the children, melted on their faces, in their hair! That was delightful. The rest of you was snug and warm under blankets and comforters, with a hot brick at one’s feet. The wind howled outside; sometimes the white light from the snow and the half-strangled moon came in through the single end window. Each child had his own dream-adventure. They did not exchange confidences; every “fellow” had a right to his own. They never told their love. If they turned in early, they had a good while to enjoy the outside weather; they never went to sleep until after ten o’clock, for then came the sweetest morsel of the night. At that hour Number Seventeen, the westbound passenger, whistled in. The station and the engine house were perhaps an eighth of a mile down the hill, and from far away across the meadows the children could hear that whistle. Then came the heavy pants of the locomotive in the frosty air. Then a hissing--then silence: she was taking water. On Saturdays the children were allowed to go down to the depot to see Seventeen come in. It was a fine sight on winter nights. Sometimes the great locomotive used to sweep in armoured in ice and snow, breathing fire like a dragon, its great red eye shooting a blinding beam along the white roadbed and shining wet rails. When it stopped, it panted like a great beast. After it was watered by the big hose from the overhead tank, it seemed to draw long deep breaths, ready to charge afresh over the great Western land. Yes, they were grand old warriors, those towering locomotives of other days. They seemed to mean power, conquest, triumph--Jim Hill’s dream. They set children’s hearts beating from Chicago to Los Angeles. They were the awakeners of many a dream. You are so totally taken in by these remembrances, these irreplaceable and irretrievable mementos of the past, that when the inevitable blow falls, it comes down on you like a cudgel. Miss Knightly, the superintendent who spent that weekend at home with Lesley, is traveling that winter, and strikes up a conversation with the train conductor, a man named Redman who hails from the same little town as Lesley. Their conversation quickly centers on a terrible blizzard that has blanketed Nebraska and disrupted train service throughout the region. Miss Knightly wasn’t the only one who went white at receiving the news. It’s a testament to Cather’s craft that such an unexpected blow could be so effectively delivered.